The City of Coopersville is expanding their facultative lagoon system to an Activated Sludge process. As part of the expansion, a new aeration system is being added to the lagoon cells along with secondary clarifiers and RAS. The Triplepoint MARS retrievable aeration System was selected by OMM Engineering and the Owner as the basis-of-design and is currently being installed by Northwest Kent Mechanical and Triangle Associates Inc. The patented “double bubble” MARS aerator couples the mixing efficiency of a coarse bubble static tube with the high oxygen transfer efficiency of fine bubble diffusers. Individual MARS aerators simply rest at the bottom of the lagoon and utilize the full water depth to maximize aeration and mixing efficiency. 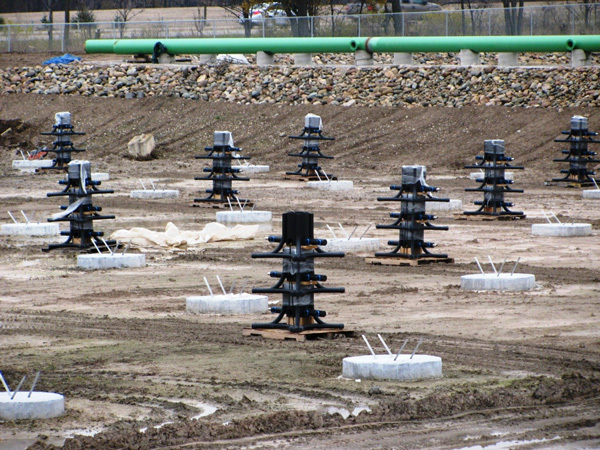 Each aerator is accessible and removable for inspection and maintenance from the water surface without having to drain the lagoon.In addition to the highly efficient Triplepoint diffuser system, Coopersville will also be receiving Siemens Turbo Machinery, single stage centrifugal, premium efficiency, blower packages with a Dissolved Oxygen Control System. These 300 HP blower packages will be housed in acoustical enclosures and utilize dual point control to operate the blowers at their optimal efficiency based on “real time” oxygen demand. The capacity of the blower arrangement can be reduced up to 80% of the design capacity based on dissolved oxygen requirements. Aeration control is also based on the “most open valve” principle and header pressure monitoring to meet the oxygen demand while also maintaining optimum air flow dynamics throughout the aeration system. This innovative system will provide Coopersville the ability to handle variable flow and loading from their local Dairy Processor while keeping electrical and operating costs to a minimum. The system is expected to be commissioned in early 2012. © 2019 Hamlett Environmental Technologies. All rights reserved.